At 11:30 AM, no one could foresee what was about to come. The black and white bold lettering that displayed the “EAGLES” logo in the end zones could still be seen clearly, as well as the sidelines and yard makers. And though some snow and a possible wintry mix was in the forecast, most assumed that it would be a nuisance at most. In a matter of 90 minutes, all that had changed. By kickoff, not only had the white stuff blanketed the field, but the driving snow that had commenced would put the brakes on the game plan of both squads. Suddenly, LeSean McCoy running outside was a recipe for disaster. And any ideas that the Lions may have had of Calvin Johnson running rampant across the field were to no avail as the conditions played a factor early with Detroit fumbling twice and thwarting two potential scoring drives. Meanwhile, the Eagles were having their own issues with their inability to move the ball, as the offense amassed only 130 yards and no points heading into the half. And when Lions punt returner Jeremy Ross returned a kick for 58 yards and a touchdown, things looked bleak as the Birds were down 14-0 midway through the 3rd quarter and showing few signs that they would be able to turn the game around. And then suddenly, the Eagles came to life, highlighted by two long LeSean McCoy runs and a DeSean Jackson touchdown as the Birds took over the game in the 4th quarter, winning 34-20 in a contest that will long be remembered as the 1st Eagles home game played in the snow in the modern era. Having had Eagles season tickets for thirteen years, I had always remarked that I’d love to see one game in a snowstorm. 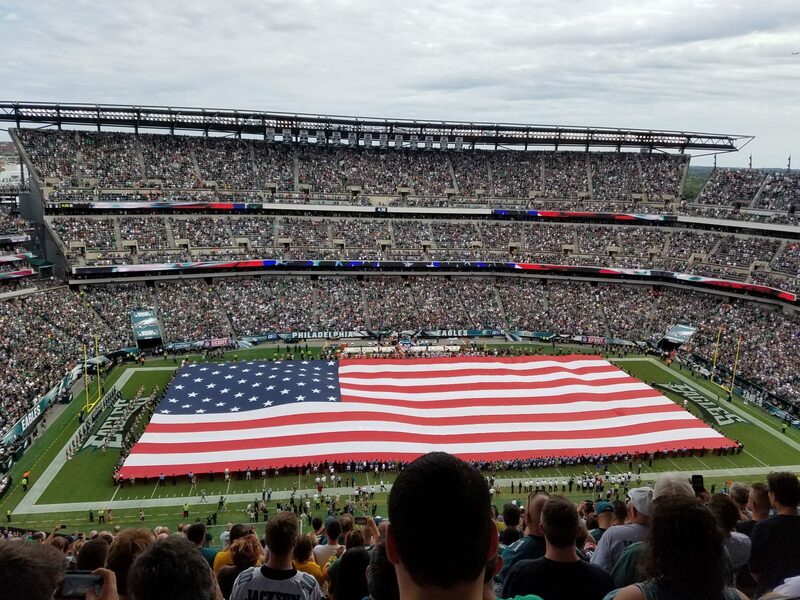 But the irony is that I had given up my seat for this game almost two months ago with very little thought that a 9-inch snowstorm would hit Philadelphia on December 8th right before kickoff. Especially when it hadn’t happened anytime that I can remember. What was supposed to be a rebuilding year, and started that way with the Birds at 1-3 and then 3-5, now has turned into a special season that no one had predicted, much like last Sunday’s snowstorm. And with the Eagles on a 5-game winning streak, and Dallas one game behind, the team actually has a chance to render the final regular season game on the road against the Cowboys, potentially meaningless. If the Birds can manage to win their next two games (on the road against the Vikings; home against the Bears) and Dallas manages to lose one of its next two (home against the Aaron Rodgers-less Packers; on the road against the Redskins), the Eagles will have wrapped up the NFC East title with one week to spare, a possibility which seemed unfathomable when they stood at 3-5. But first things first…the Eagles head to the 72-degree climate controlled environment of the Hubert H. Humphrey Metrodome on Sunday to face the 3-9-1 Vikings, and while Minnesota’s record may indicate otherwise, this is a DANGEROUS game for the Birds. The Vikings three wins have all come at home, and they played the Ravens tough on the road last week before eventually losing. The Eagles would do well to not take this game lightly, with or without Adrian Peterson, or an upset could be in order. Patriots at Dolphins 1:00 PM CBS – The Patriots are still in line for a 1st round bye and a possible #1 seed in the AFC, though a stumble could drop them down into the #3 seed and having to host a game at home in the 1st round. The Dolphins have come on strong as of late, though they are still on the outside looking in, and needing a Ravens loss. Ravens at Lions 8:40 PM ESPN – Both teams currently hold playoff spots but sit in a very precarious position, with the Lions holding onto the NFC North lead and the Ravens holding the final AFC wildcard spot. The Last Word – From 2001 to the beginning of the 2008 season, Matt Millen held the title of GM for the Detroit Lions. And while Millen was a solid NFL player and decent color commentator for NFL games, his awful decision-making as GM of the Lions set the team back for years.